For me, dressing is always a question of principle, respect, a sense of order, not to disguise myself, even in rotten places. BHL, Bazaar. I don’t care much about style or appearance. I have always dressed the same way. No eccentricity. No surprise. Somebody who cares about fashion changes; somebody who cares makes an event of his own style. I have worn the same white shirts, the same person has made my jackets, for 30 years. I get older, but I have the same size hair. I am a man of habits. Fashion is a language, and what is interesting about fashion today is that there is no longer fashion. That is, there is an appropriation of fashion by people in the street. There was a time when you saw a woman who was a high-fashion model, who was a caricature, a cartoon of real life. But now people are more free with their fashion. The most interesting people make their own fashion out of what designers offer them. Women on the street have become hackers of the fashion world. They break the code; they undo and redo. It is the democratization of fashion today that interests me. Fashion communicates a relationship to the world, to one’s body. What is the reply to the old philosophical inquiry between soul and body: Are they at war? Are they in harmony? Are they friends or enemies? There are moments in life, in the day, where the two are at war, moments where they are in harmony, days when you feel at war with your body, and days your body is your friend. Fashion says that. Style says that. If I were compelled to describe what my own style means, I would probably say: a sense of freedom. At the same time, a mixture of internal freedom and a freedom of movement. If my style says something it is that. But I am not sure. Bernard-Henri Lévi, Wall Street Journal. 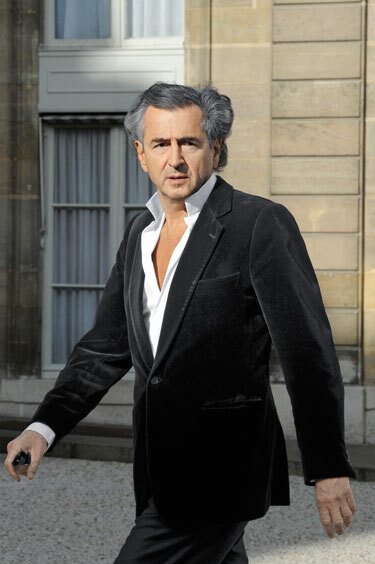 BHL has his uniform down–long wavy hair, crisp white shirts often open to the navel, dark Charvet suits. This is the dress of a highly self-conscious sophisticate, but not that imaginative. I would love to see a photo of BHL next to Tom Ford: with the exception of the difference in hair styles, both favor a similar style–extras on the set of Casino Royale? Both favor the rather louche unbottoned-shirt look. In the left photo, last row, BHL is with Mario Vargas Llosa. What do you think his style communicates? Wonder if his companion, the always flamboyantly dressed Daphne Guinness, will introduce a few changes to his look. I love the way he rocks that big 70s hair! But…HBL and Tom Ford similar in style? I see them as quite different. The first a classic relaxed Mediterranean look and the second pure costume. HBL doesn’t wear ties, for instance, nor indeed business suits several inches too short and massive Florsheim gunboats with no socks. Ford’s stuff seems to appeal only to a fringe group of rich 20-something fashionistas who weigh 110 pounds, while as you point out here HPB’s style is timeless. I prefer Llosa’s style and persona to HBL’s, who reads a little bit like a caricature himself. But real style can be louche, and even glaring, why not? More power to him. I applaud the white shirts and well-fitting blazer. In my view, Bernard-Henry Lévy’s style is very much elegant and cosmopolitan. The angular neckline, coupled oftentimes with a Mao-style collar, such as in Lévy’s Tel Aviv photos, is timeless. When BHL speaks I always get the impression that he is crossing swords with someone in a pseudo-intellectual duel. I have a hard time trying to understand people who take them selves too serious. That said… his style (!?) is…lacking of imagination as he seems to avoid risks at any cost. An open shirt (especially a white one) under a classic dark blazer is anything but stylish…it is nothing less than cautiously bourgeois. I prefer his mind even though sometimes I have a hard time following his acrobatic intellectual prowess. Bernard is not someone who particularly cares about his appearance. He expresses that fashion is a language that communicates how the soul and body relate to each other. He seems very put together in the images shown on this blog. Yes, he is wearing very similar outfits in every picture that can show his lack of interest in style, but he looks very clean. This raises the question of whether or not fashion has to do with how a person is presented physically. How put together do they look regardless of what they are wearing, and does this mean they care about style or simply their wellbeing? I suppose it’s worth pointing out here that this guy is widely considered a charlatan in the academic world, someone who plays the part of an intellectual well for public consumption but who cannot hold his own as a researcher among his peers. I’ve heard him talk on many occasions and he always comes off to me as a confidence man, a sort of old-time, traveling snake-oil peddler who can charm you into ignoring your suspicions that he’s a pseudo-intellectual. Anyway, I like his jacket.